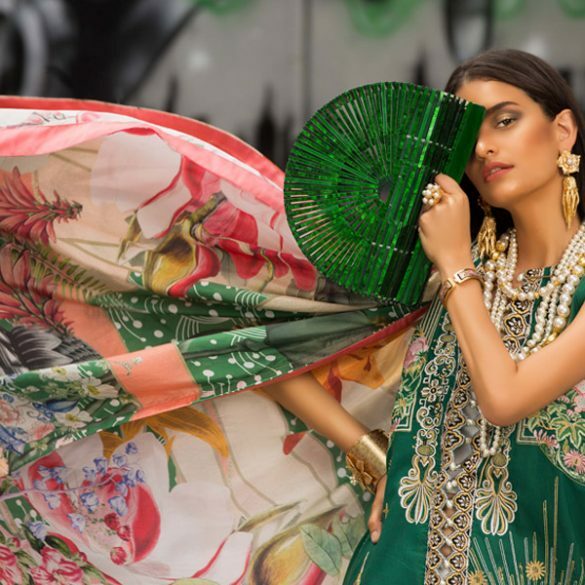 Tena Durrani’s creativity truly knows no bounds, and where most designers need a vacation after churning out a single bridal week collective, this young designer is known for releasing one after another assortment of astonishing wedding and bridal wear every couple of months! Having had specialized in formals for many years, Tena has no doubt gained valuable insight into just what makes an ensemble click which is what we feel when we look at her collections. She has an extraordinary grasp of using a variation of elements that contribute to the overall effect of the outfit that is always stunning and immensely gratifying. In this latest shoot by Ayaz Anis featuring the striking Huma Khan who has been glamorously styled by Raana Khan, Tena showcases some advanced layering techniques using silk brocade with an overlay of embellished net creating a very soft and rich feel to the pieces. She adds modern day elements with high front open cape jackets and kimono sleeves detailed with an opulent mix of resham embroidery and sequin, crystal, and zardozi hand crafted floral and ‘jaal’ motifs. There is significant thought given to color arrangements of both fabrics as well as thread works that work harmoniously with the different textures at play. Net which is trending high for trousseau this season for its exotic vintage feel is abundantly used and the pairing with shaded silk brocade makes the effect even more delectable as shown below. At the same time there are self embroidered contemporary cuts to add flavour with ethnic mirror work shimmering through. Handmade tassles, appliquéd and cut work necklines and dupattas are a distinct mark of Tena Durrani wedding wear along with the weight given to resham thread work. Tena steers clear of drowning her formals in a sea of bling and sparkle, instead she ensures defined motifs and designs that come through rather than appearing lost. That is one of the aspects we appreciate most in her work. No wedding wear would be complete without the perfect jewelry and the breathtaking traditional jewels for this shoot were provided courtesy Sherezad. Tena Durrani’s collections can be ordered via appointment at their flagship studio and their space at Labels multi-label store in Karachi. Orders can also be placed online on their web store for worldwide shipping. For more details and collections visit her Profile Page. Ready, Set, Shoot: Maheen Karim Occasion Wear A/W2013!